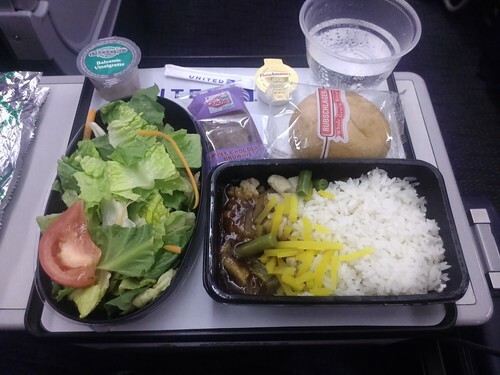 When the flight attendant asked if I'd like the chicken or the vegetarian selection, I asked her what was in the latter. She told me that it was "some kind of pasta." I thus assumed that it'd be some nasty pasta primavera, and thus got the chicken instead, which turned out better than I thought it would be. Then I noticed the vegetarian selection that my neighbor got, and it turned out to be lasagna, which I wish that gotten that instead. At least this 14 hour flight in economy wasn't as harsh as I thought it would be. It was nice not having a seat nor bulkhead in front of me, and those firm headrests did a good job of locking my head in place.